Hi everyone, welcome to english-learning.net . I hope you are well today. 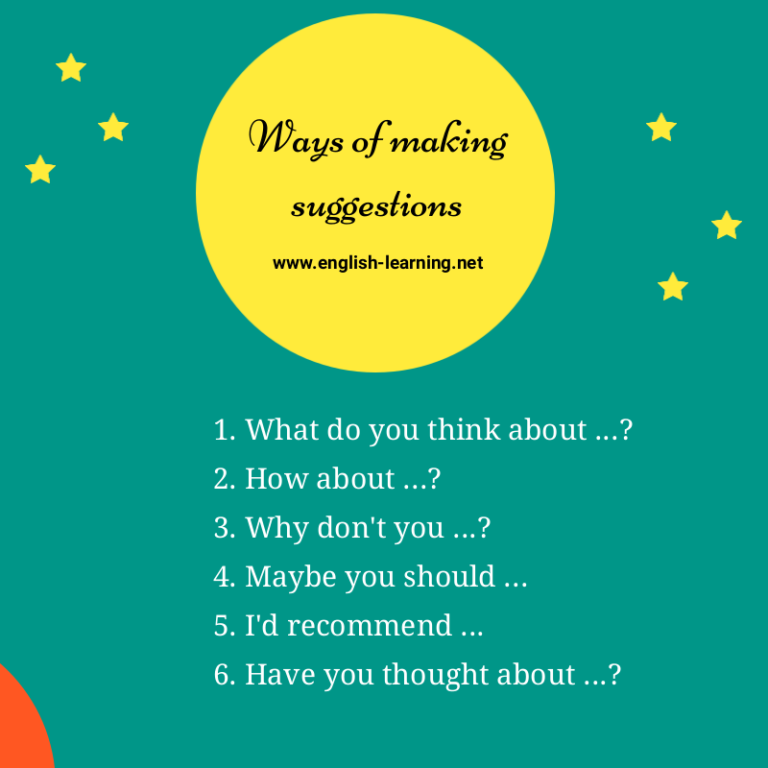 In this lesson, we are going to learn some cool ways to make suggestions or to give ideas. 1. What do you think about …. ? Hey, for the party tonight, what do you think about inviting your teacher? Jenny, what do you think about giving your daddy a new shirt for his birthday? How about the coffee shop near your school? 3. Why don’t you… ? I’ve been trying to call her this morning, I need to tell her we have changed the plan. Why don’t you send her a message on Facebook, she’ll reply when she reads it. I am so stressed right now, there’re so many things to handle. Maybe you should go out for a walk and get a cup of tea. You’ll feel better. We are looking for a qualified teacher who can work in the evenings. I’d recommend hiring someone from the College of Languages. 5. Have you thought about… ? I have to pay too much for lunch every day. Have you thought about getting up early and prepare the food yourself.